Despite many romantic notions that Montague Dawson was born at sea, and the son of a captain, the truth is sadly somewhat more prosaic. In fact, he was the son of an engineer, born in Chiswick in 1895. His father was a keen sailor, and his grandfather had been a successful landscape painter, and both of these passions were to shape his life. Despite many romantic notions that Montague Dawson was born at sea, and the son of a captain, the truth is sadly somewhat more prosaic. In fact, he was the son of an engineer, born in Chiswick in 1895. His father was a keen sailor, and his grandfather had been a successful landscape painter, and both of these passions were to shape his life. After a childhood spent in and around boats, especially after the family moved to Southampton Water, it was no surprise that Dawson joined the navy at the outbreak of the First World War. Already a keen artist, and with a number of years experience working on posters in a commercial art studio in London, Dawson spent much of his time as a Naval officer drawing the events unfolding around him. Serving on trawlers and minesweepers, he regularly submitted work to ‘The Sphere,’ a prestigious magazine of the time. The magazine relied on freelance illustrators such as himself to record scenes of the war at sea, and Dawson happily obliged until the very end of the war, when he was fortunate enough to witness the surrender of the German fleet. His drawings of this historic event were given a complete edition of the magazine. ways as possible, he often travelled out into the North Sea to experience it in all of its fickle moods, and in 1924 joined a treasure-seeking trip to the Carribbean. This was aboard a sailing ship, and although no treasure was found, his illustrations were extremely popular, and the experiences of the voyage were to influence him for the rest of his career, with a romantic attachment to the pirates of yesteryear and a confirmation of the joy and beauty of ships under sail. life. With his increasing success, Dawson and his family were able to move out of London and closer to the sea, firstly in Milford on Sea, and then to a large and imposing 1930s house nearby on the coast. The declaration of war had an understandably large impact on the family, but with Dawson too old for active service, he kept himself busy by reigniting his war scenes for ‘The Sphere.’ As his work was of huge morale-boosting value, he worked closely with the Admiralty, eye-witnesses, and photographs to ensure that his scenes were as authentic as possible. This necessary eye for detail was to stand him in good stead as his painting career continued to flourish after the war. most of which he could never hope to satisfy. Despite the heavy workload, he refused to compromise the quality of his painting, and most of his finest pieces were created in the last fifteen years of his life. He remained in the same house and studio for thirty-five years, and by his death in 1973 could boast collectors such as the Queen, US Presidents Eisenhower and Johnson, and the Sultan of Morocco. Indeed, at the height of his career in the 1960s he was rumoured to be the second-highest paid artist in the world, behind Picasso. 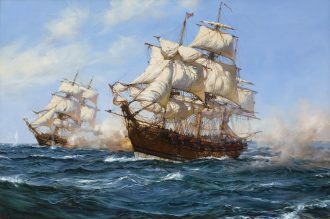 With his combination of incredible detail and accuracy, and mastery of painting sea and sky, it is no wonder that Dawson is seen as one of the world’s great marine artists.